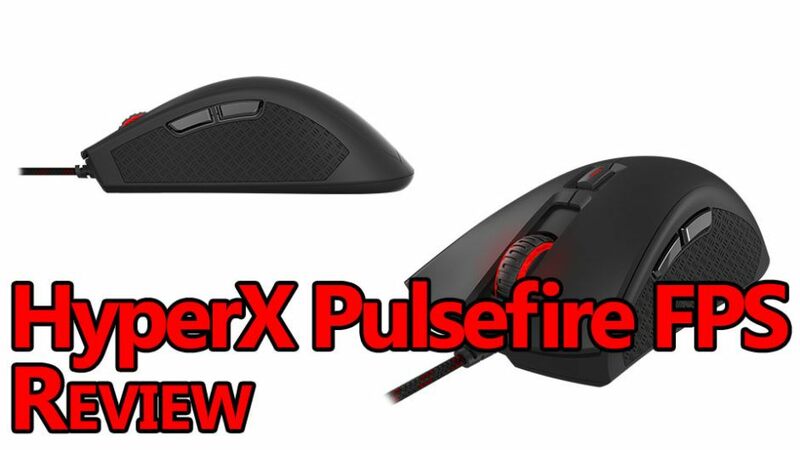 The Pulsefire FPS from HyperX is an awesome gaming mouse in the sub $50 price range. It’s using Omron switches, a Pixart 3310 sensor, and gives you braided cabling and massive rubber grips. You might know of HyperX more as a RAM, gaming headset, or SSD company, but they’ve recently jumped head first into the other essential gaming peripherals like mice and keyboards – and they’ve done it well. 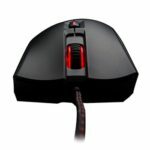 The brand new Pulsefire FPS from HyperX is an awesome gaming mouse in the sub $50 price range. It’s using Omron switches, a Pixart 3310 sensor, and gives you braided cabling and massive rubber grips. 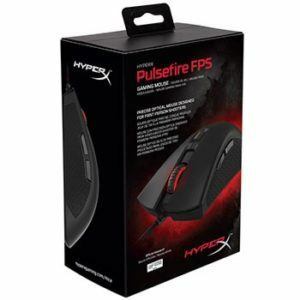 For starters, the Pulsefire FPS gaming mouse was sent to me (for free) for review by HyperX. That being said, my reviews are never biased regardless of how I receive an item. During my time using the Pulsefire FPS, I played a ton of games in every genre to make sure it performed and didn’t start to break down after a few hours of use. During this time I only had one minor complaint about the middle mouse button’s switch being somewhat less “clicky” than the other 5 switches. 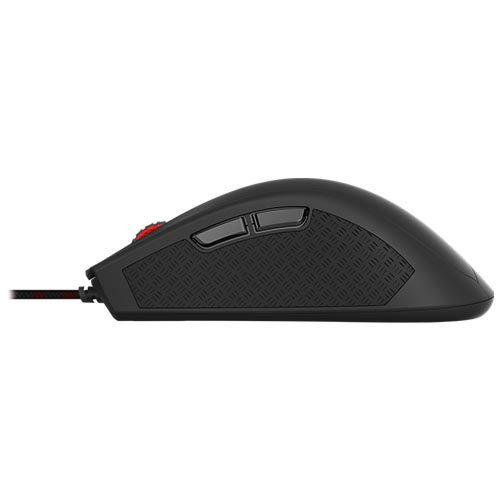 Overall, I’ve really enjoyed using HyperX’s first gaming mouse, and I would definitely recommend highly considering it as your next mouse, if you’re looking in the sub $50 bracket. I love black and red, and the Pulsefire FPS gives me more than enough black and red to be happy forever. What it doesn’t give you is RGB lighting. Personally, I’m not very put off by this, but I know that some of you might be. 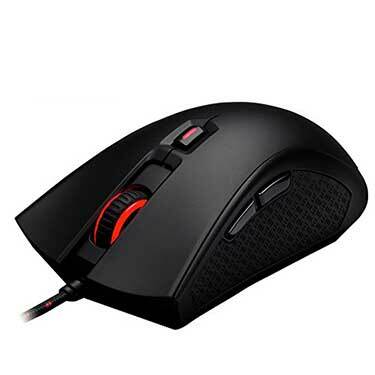 The overall design is very similar to a Razer Deathadder except for the Pulsfire’s added DPI toggle below the middle mouse button. Other than that, the Pulsefire FPS has larger rubber grips and a more “clicky” response when you actuate most buttons. The braided cable is great to see as it really increases the life of a mouse. It’s black and red which is also awesome if you have a black and red theme to your desktop setup. It’s a very comfortable, lightweight mouse that I think a lot of people can easily plug in and start using without really having to worry about getting used to a new mouse. 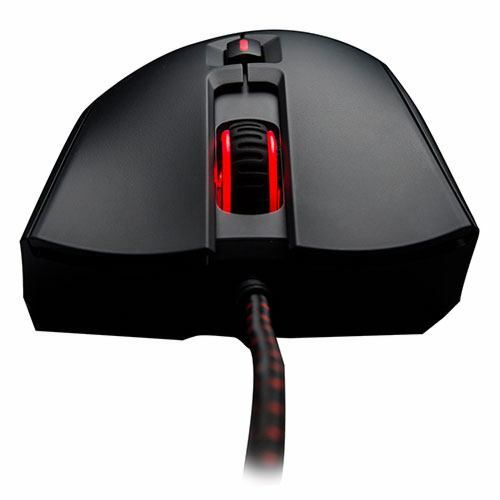 Something I noticed that might not be too great in the future is how recessed and large the sensor’s opening is on the bottom of the mouse. It might not be a huge issue for some, but I could see a lot of stuff getting jammed up in there after lots of use in some scenarios. There are 4 preset DPI profiles (400-3200DPI) that you can easily toggle between using the dedicated DPI button below the middle mouse button. The profiles are color coded so it’s pretty easy to know which one you’re on, white is the lowest, yellow is the highest where blue and red lie somewhere in the middle. There are a total of 6 buttons including the dedicated DPI toggle and as far as I can tell they all use Omron switches. Most of them feel great with nice tactile feedback, but the middle mouse button is kind of “meh” in comparison. I had absolutely no issues with performance with the Pulsefire FPS and it definitely stacks up against higher priced competition well. The only real downside is that the middle mouse button is less responsive than the other 5 buttons, but it’s not a major issue for me personally. 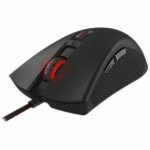 From the great switches to the braided cable and the great rubber grips, you definitely want to consider the Pulsefire FPS if you’re thinking about upgrading your current gaming mouse. That said, the Pulsefire FPS does have some extremely stiff competition from other mice like the Logitech G502 Proteus Core and even the Razer Deathadder Elite.